If you enable the Use FQDN option, the tools will append the SMS_R_System.FullDomainName field to the computer name. If this option is disabled, the SMS_R_System.Name field is used. 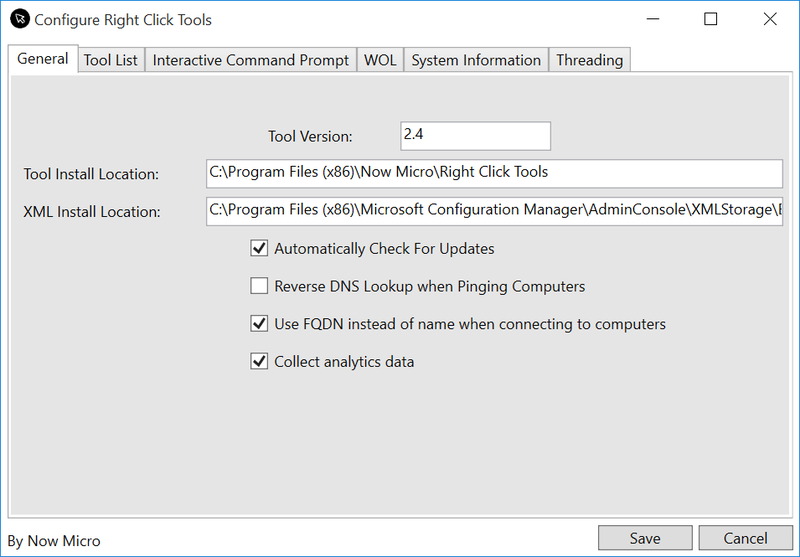 The Use FQDN option should enable the tools to work in multi-domain environments and work with computer names that are exclusively numerical. This option is enabled by default as resolving computer names via FQDN should work in most environments. If the Reverse DNS Lookup option is enabled, then the tools will attempt to perform a reverse lookup against your DNS servers to determine if the computer name returned matches the computer name that the tool was run against. If this name doesn’t match, it will give an appropriate message. By default the Reverse DNS Lookup option is disabled as not all environments will have reverse lookups enabled on their DNS servers. Additionally, to help us better understand where we should focus future development to improve the next version of Recast RCT Free, we’ve started collecting analytics in this version of the right click tools. The data we collect is purely usage data – we do not collect any company or user identifiable information. This option is on by default. Let us know how the new release is working for you on the forum.